Sunita of Sunita’s world started Think Spice in April 2008. She has even allowed several bloggers host this event (here’s the list from Sunita’s site) and I’m lucky to be host this popular event. Many thanks to Sunita. Why this theme – Turmeric? While searching for the right theme for the event, I found that turmeric (Holud, Haldi) was not covered by any one till date. Turmeric is one of the most used spices in any kind of cuisine, and when talking about Indian culinary arts, turmeric is just indispensible. For an elaborate list of beneficial effects of turmeric click here. Fiery Chicken – Aliena of What’s cooking today!! Apart from these four categories there were 14 other entries which included rasam, sambhars, spicy powders, pickles, etc. Please let me know in case I’ve left out any entry or gave an incorrect URL/blog name. You can email me or post a comment for this, and I’ll correct it. The Think Spice event for January 2010 hosted by Nandini of Food Food Food. Here’s the complete list of round ups. Oh suc a lovely round with so many gorgeous recipes…lovely…. .-= Kanchan´s last blog ..B’bye 2oo9 ! =-. Just added the link, sorry to miss you out. U ve done a great job- so many bright entries. Small correction: Cham of Spice-Club- Sudeshna! Oops, thats a bad mistake, corrected it. .-= EC´s last blog ..WYF: Tea time snack event roundup- Part 2 =-. Extremely sorry for missing out the two recipes. Have updated it now. Thanks for the reminder. Oops. Updated Swathi. Thanks. An eventful New year to you too. 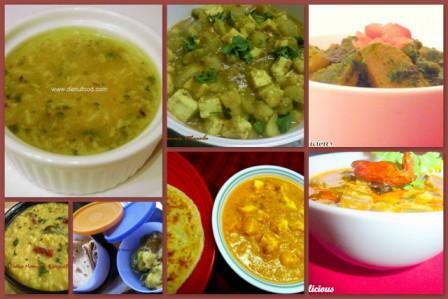 .-= Ruchikacooks´s last blog ..Recipe Marathon: Day 7: Ghar ka Khana (Simple home made meal) =-. Thanks a lot and Happu New Year to you and your family too. wish you and Kalyan and your entire family a very happy new year..
Tummar MM Mingle er jonne dekhi kicho pathate pari ki naa :).. Thank you so much and wish you the same :). Mingle entryr janne apekhai roilam. Great round-up! A request – my mini idli pepper fry is missing in this round-up is missing. I’m resending them to yo’ e-mail inbox. Plz update. .-= Nandini´s last blog ..Shrimp Fried Noodles =-. Sorry I missed your entry somehow. I have updated the post, please do check now. Excellent round-up, Sudeshna….so many nice recipe, bookmarked it..wish you & your family a joyous new year….. Thank you so much :). Wish you a great new year, rather a wonderful new decade. Excellent roundup, many delicious dishes..
.-= Priya´s last blog ..French King Cake/Galettes Des Rois =-. Awesome round up with colorful recipes..
.-= Ruchikacooks´s last blog ..Recipe Marathon: Day 6: Cabbage Kofta =-.